The application which needs clean or sterile processing requires the use of the sanitary valve. The industries like food, dairy, pharmaceutical, medical and chemical generally need the use of Sanitary valves. While selecting a sanitary valve do not forget to consider some significant specifications like the working pressure, the diameter and operating temperature of the device. Firstly, the sanitary ball valves, mostly used for on/off control without pressure drop. The next is the sanitary butterfly valves which do the activity of flow regulation in large pipe diameters. Then comes the sanitary choke valve, effective for high-pressure drops found in oil and gas wellheads. The sanitary check valve, let the fluid to pass through in a single direction only. The sanitary diaphragm valve, often used in the pharmaceutical and food industry. The sanitary gate valve, chiefly used for on/off control, by low-pressure drop. The globe valve, excellent for regulating flow. 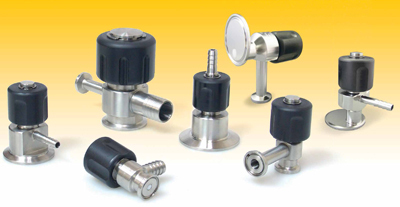 The needle valve, helpful for the activity of accurate flow control. The piston valve, useful for regulating and controlling fluids that carry solids in suspension. The pinch valve, effective for slurry flow regulation. And the plug valve, a slim valve efficiently used for on/off control however with some pressure drop. Prev: Maintenance Requirements of Sanitary Diaphragm Valves Next: How to Select the Sanitary Diaphragm Valve?